How does Nitrous Oxide Laughing Gas Sedation Work? Nitrous oxide dental gas sedation is the use of a mixture of nitrous oxide and oxygen gas to achieve a comfortable level of sedation for a patient to comfortably tolerate a dental procedure. Dr. Adams used nitrous aka laughing gas sedation more than any other because of how it is so safe, effective and inexpensive. Also since nitrous wears off so quickly people can drive after a sedation dental appointment. 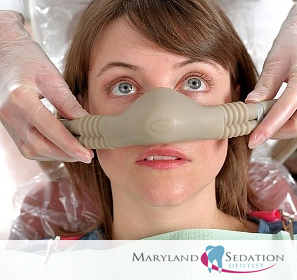 Nitrous oxide laughing gas is delivered through a nose piece where the patient breathes in the sedative gases. The Nitrous gas is typically adjusted between the range of 20% up to 70% Nitrous with the remaining gas being oxygen gas. Most patients will achieve comfortable dental sedation in the range of approximately 50% nitrous oxide and 50% Oxygen. 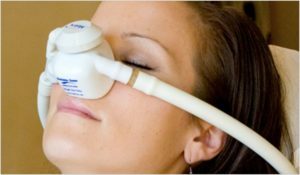 Who is a good candidate for Nitrous Oxide Gas Sedation? Nitrous oxide dental sedation is very effective for mild to moderate dental anxiety. Patients can eat or drink prior to having nitrous oxide gas sedation, it is very non-toxic and there is no hang-over effect. The effects of laughing gas wears off very quickly and patients can drive a car 30 minutes after a sedation appointment and carry on with the day as if nothing ever happened. Nitrous Oxide laughing gas has been proven to be the best sedation method for patients who are mild to moderately anxious. Laughing gas is the sedation dental clinic favorite. The speed of onset, margin of safety, low incidence of side effects, patients can drive afterwards and no hangover effect all make dental gas sedation very popular among dental practitioners as well as anxious patients. Nitrous oxide dental gas also works moderately well in suppressing gag reflexes. One absolute contraindication is pregnancy. Pregnant women should never be sedated with laughing gas – nitrous oxide. Care should be used when nitrous oxide is used in combination with other oral sedatives such as valium, aka. diazepam, xanax and other sedatives or anti-anxiety medications. Never pretreat yourself with an oral sedative without telling your sedation dentist you have done so. Nitrous laughing gas in combination with oral sedatives can push a patient into general sedation and cause a level of sedation many practitioners are not capable of managing. If a dentist is not trained in handling general sedation or the facility is not equipped for general sedation, the combination of an oral sedation and nitrous oxide sedation can produce an emergency with a grave outcome.